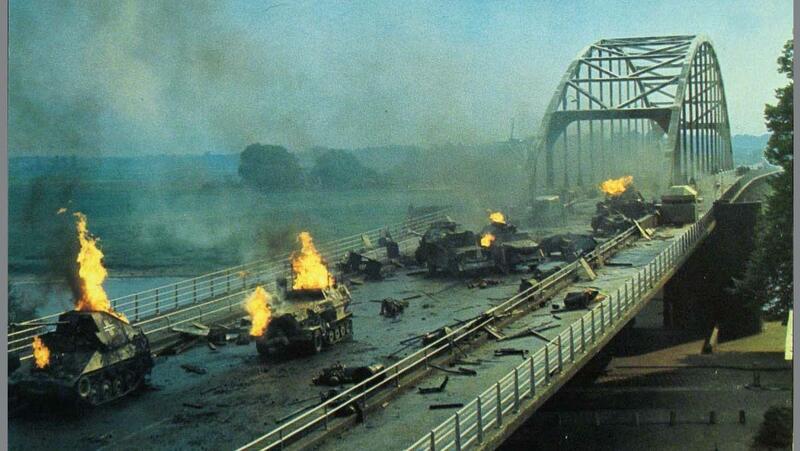 A BRIDGE TOO FAR, a huge, factual, 1977 all-star WW2 epic, has fared better rep-wise, in the hindsight of years than it did upon initial release, when it took a barrage of flak for overlength, over-direction, over-everything. Smoke cleared, it can also be put to rest that the $26,000,000 production flopped: it took in twice that amount. 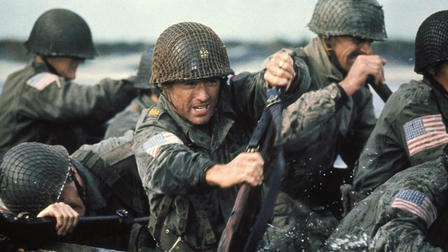 To do a simple good/bad mop-up let’s first establish that this tells the story of the disastrous Allied assault in 1944 Holland, (the biggest parachute drop ever) and was adapted by William Goldman from a non-fiction best-seller by Cornelius Ryan, famous for the classic D-Day saga “The Longest Day”, its like-named 1962 movie then serving as Mighty Grandpa of huge, factual, all-star WW2 epics. People who like that kind of thing will enjoy this, despite its flaws. People who don’t –won’t, regardless of its good points. So, what’s good? 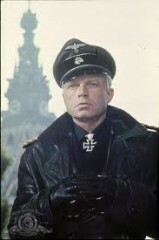 Quality star turns, especially from Sean Connery, Anthony Hopkins, Robert Redford and Dirk Bogarde, plus assuredly fine bits from Laurence Olivier, James Caan, Maximilian Schell, Hardy Kruger, Gene Hackman, Liv Ullmann, Michael Caine, Edward Fox, Denholm Elliott, Arthur Hill and Wolfgang Preiss. Whew! There’s a ton of action, much on a quite large scale, with some pretty darn impressive (heilige schiesse!) bombardments, furious skirmishes, a gripping sequence depicting a heroic river crossing, plus period planes, tanks and assorted hardware up the kazoo. Geoffrey Unsworth provides rich color cinematography. Several telling slices of counterpoint to all the mayhem—-escaped asylum patients waving at the troops; the mocking cackle of cause-oblivious geese; an old woman, bothered by all “the noise..she hates it!”, adjusting her beret in a mirror before vainly summoning a taxi during a firefight; some dependable Brit understatement in the face of calamity. All affecting. So, what’s not so hot? While the 175 minutes of running time seems par for the course for a big, complicated story, it crawls for the first hour, there’s too much lingering footage of vintage airplanes, much talk about urgency and not enough feel for it, and eventually the impressive explosions lose some punch after the 200th detonates. Elliott Gould always grates, and Ryan O’Neal isn’t remotely convincing–he drew the heaviest casting critiques. 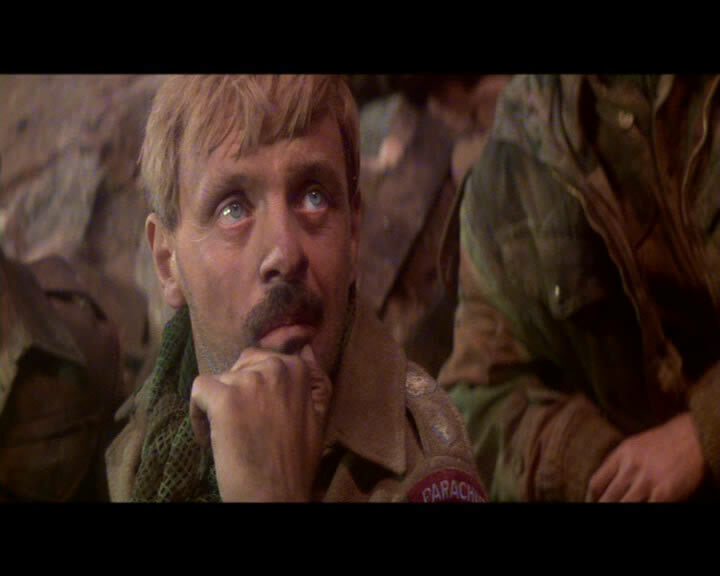 In directing, Richard Attenborough, while handling most of the actors well, and all the combat (with a fine squad of second-unit men), indulges in too many maudlin moments that hit the “important tear-jerk” button, and hold it seconds too far. 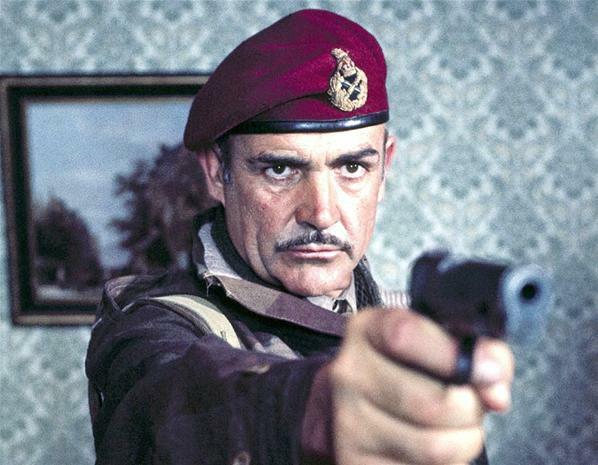 WORST–by far–is his allowing John Addison’s simply awful score to ruin every scene it touches. Evidently the idea was to have a jaunty ‘holiday parade ground’ march as volte-face irony, but the effect backfires completely, coming off mawkish instead of moving. This is strike #2 (and out ) for Mark v. Addison, whose historically boneheaded Oscar win on Tom Jones robbed Alfred Newman his career topper for How the West Was Won—shame! Finally, the somber—apart from that hideous orchestra— and downbeat tone of the story is an unavoidable bummer. It’s a credit to the business acumen of producer Joseph E.Levine that he shrewdly pre-sold to distributors,as big-budget films about defeats are traditionally hard-sells not just to backers, but to audiences, who might want to spend several hours and dollars at Pearl Harbor or the Alamo but don’t really wish to feel mostly hopeless afterwards.